Acquire the assets of an Ontario corporation with this Purchase Agreement for Assets of Operating Company. 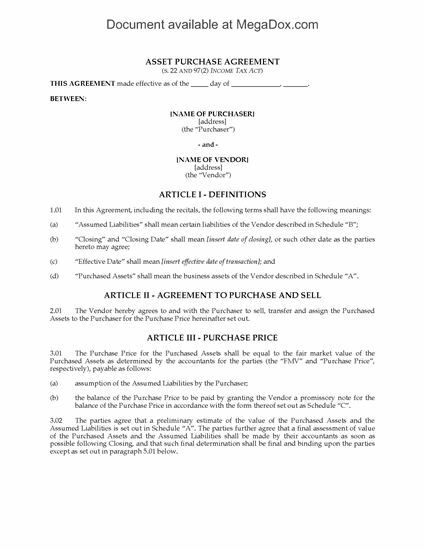 The seller (vendor) sells the assets of a company to the purchaser and the purchaser assumes the company's liabilities as part of the purchase price. The balance of the purchase price will be secured by a promissory note. The parties agree to file joint elections under sections 22 and 97(2) of the Income Tax Act (Canada) and as required under the Ontario Corporations Tax Act. 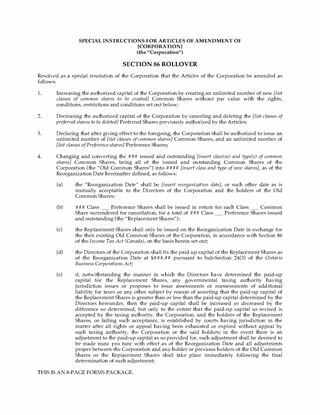 The form includes a Section 116 Affidavit to be sworn by a corporate officer of the vendor, if applicable. 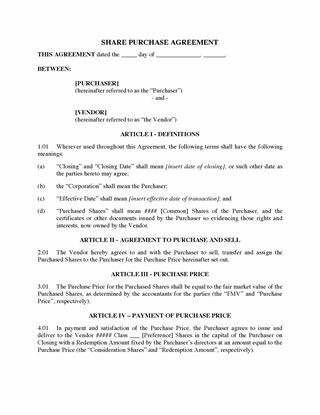 The form also includes a Promissory Note. The Ontario Purchase Agreement for Assets of Operating Company is a fully editable legal template. Negotiate the purchase of a Canadian business with this Letter of Intent to Purchase Assets of Business template for Canada. A letter of intent is not a legal contract, except for certain provisions such as confidentiality clauses which prohibit either party from disclosing any confidential information belonging to the othe rparty. 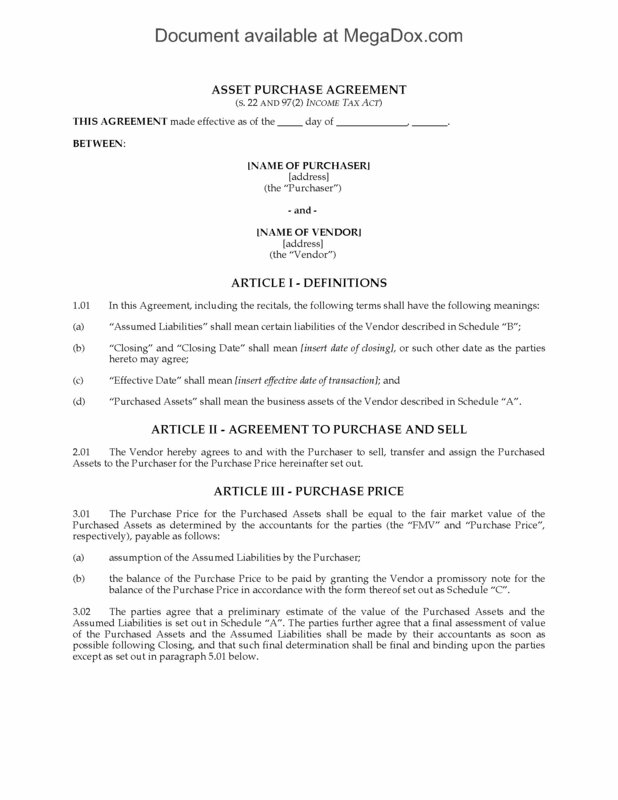 The buyer is offering to purchase all of the assets and goodwill of the business from the seller. If the parties fail to execute a formal Purchase & Sale Agreement within a specified number of days, the letter of intent will expire. If the seller fails to go through with the transaction for no reason, the seller agrees to pay the buyer's costs and a specified amount as liquidated damages. This template LOI can be used in any Canadian province or territory. A signed letter of intent signals to other interested parties that you're already in negotiations to buy the business. Download the template and get it in writing now. Purchase the assets of a Canadian business with this comprehensive Asset Purchase Agreement. The business is sold as a going concern, including assets, inventory and goodwill. The amount of the purchase price allocated to inventory will be adjusted prior to closing based on the actual physical inventory at that time. The transaction is conditional in part upon the parties completing all of their covenants that must be performed prior to closing. Schedules include Definitions, Representations and Warranties of Seller, and a Non-Competition Agreement. 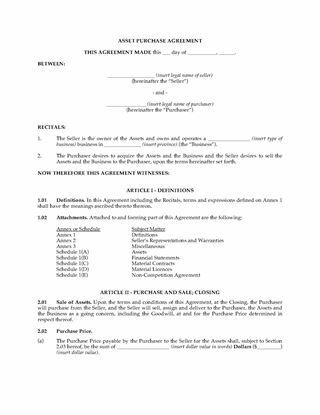 This Canada Asset Purchase Agreement is available in MS Word format, and is fully editable to fit your specific needs. Have you decided to buy an established business in Ontario? 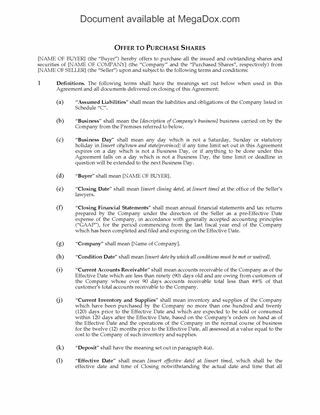 You can write up your offer to purchase the assets and shares of the company with this downloadable template. The offer is for the assets (excluding cash on hand and receivables) and the shares, but not the debt obligations of the company. Upon being accepted, the offer automatically becomes a legally binding purchase and sale agreement. The buyer will not assume any of the business liabilities except for the premises lease, maintenance contracts and salaries of employees that will be kept on after the closing. The parties agree to review and make any adjustments to the purchase price six months after closing. It is the seller's responsibility to terminate employees, prepare financial statements, file the final income tax return and pay corporate taxes as of the closing date. Writing an offer to purchase can be easier than you think, if you start with this Ontario Offer to Purchase Business Assets & Shares. Buy it, download it, and get started right away. Roll over certain investments under Section 85 of the Income Tax Act (Canada) with this Ontario Section 85 Asset Rollover of Investments template. The vendor sells the investment assets to the purchaser, with part of the purchase price to be paid by way of preference shares in the capital of the purchaser, and the balance secured by a promissory note (included). The parties agree to file joint elections under Section 85(1) of the ITA and as required under the Ontario Corporations Tax Act. The file includes a Section 116 Affidavit of Residency to be sworn by a corporate officer of the vendor (if applicable). This Ontario Section 85 Asset Rollover of Investments is provided in MS Word format, and is fully editable to fit your specific circumstances. Prepare a Section 85 Asset Rollover Agreement of Land for Preferred Shares with this easy-to-use template for Ontario, under Subsection 85(1) of the Income Tax Act (Canada). The vendor sells a parcel of land for fair market value to a holding company in exchange for preferred shares in the holding company (a rollover) with a redemption amount equal to the purchase price of the land. The parties agree to file joint elections as required under the Income Tax Act and the Ontario Corporations Tax Act. The file includes a Section 116 Affidavit of Residency, to be sworn by a corporate officer of the vendor, if applicable. This Ontario Section 85 Asset Rollover of Land for Preferred Shares is available in MS Word format, and is fully editable to fit your specific circumstances. 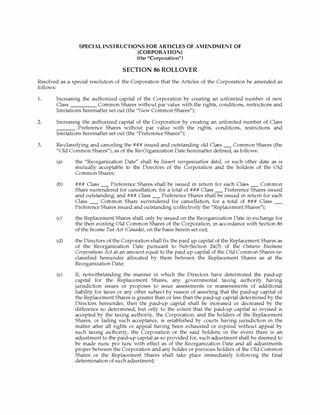 Exchange (roll over) certain assets for preferred shares in an Ontario company with this Section 85 Rollover Agreement (Assets for Preferred Shares). The rollover is pursuant to Subsection 85(1) of the Income Tax Act (Canada). The vendor shareholder sells the subject shares to a holding company in exchange for preferred shares in the capital stock of the holding company with a redemption amount equal to the purchase price. The parties agree to file joint elections under Section 85(1) under the ITA and as required under the Ontario Corporations Tax Act. 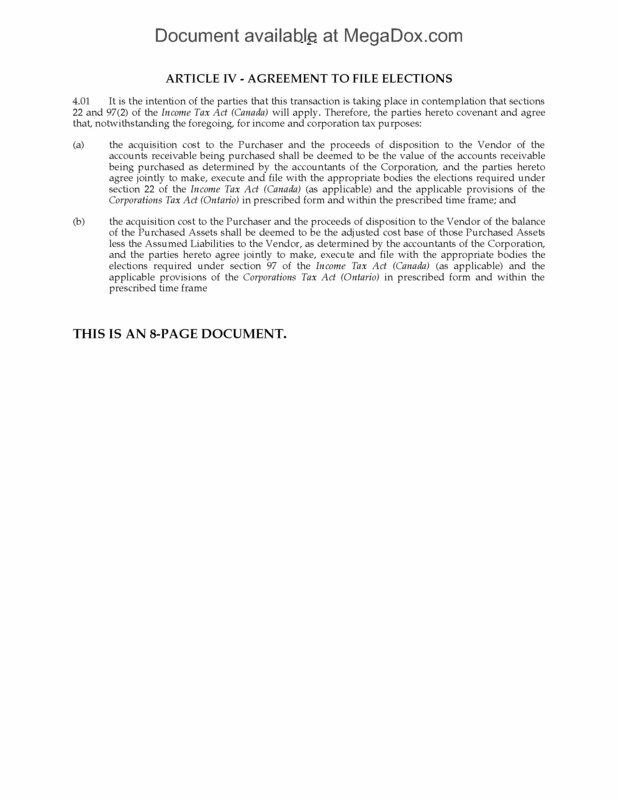 The file includes a Section 116 Affidavit to be sworn by a corporate officer of the vendor, if applicable. The Ontario Section 85 Rollover Agreement (Assets for Preferred Shares) is available in MS Word format, and is fully editable to fit your specific circumstances.